REVOLT IN 2100: After the fall of the American Ayatollahs (as foretold in Stranger in a Strange Land), there is a Second American Revolution; for the first time in human history there is a land with liberty and justice for all. 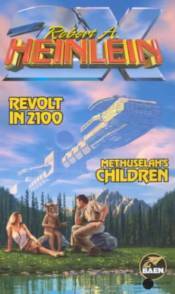 METHUSELAH'S CHILDREN: Americans are fiercely proud of the freedom they seized in Revolt in 2100, nothing could make them forswear it. Nothing except the secret of immortality.